Zack Kopplin, can you match my poker hand? 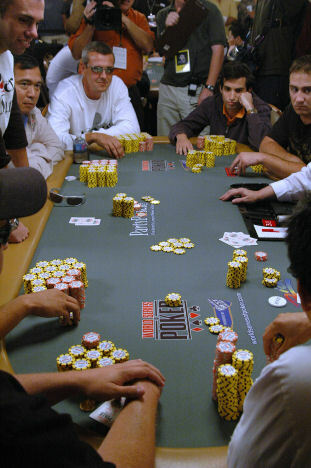 Left: 2006 World Series Of Poker main event table. Right: Congresswoman Michele Bachmann. Images courtesy of http://www.lasvegasvegas.com, The United States Congress and Wikipedia. Hi, Zack. I've been following your very well-organized campaign to repeal the 2008 Louisiana Science Education Act (LSEA). In 2011, at the age of 17, you managed to persuade no less than 43 Nobel Laureate scientists to sign a petition urging that the act be repealed, and your most recent list now has an impressive total of 75 signatures. In the spirit of true sportsmanship, I'd like to congratulate you on a sterling effort, Zack, even though I'm an Intelligent Design proponent who supports the LSEA. I guess I'd better introduce myself. My name's Vincent Torley (my Web page is here), I have a Ph.D. in philosophy, and I'm an Australian residing in Japan. I believe the wording of the 2008 Louisiana Science Education Act is fair and reasonable, as it expressly forbids the promotion of any religious doctrine in the classroom, and allows teachers to encourage the open and objective discussion of scientific theories, including evolution and origin-of-life theories. I am also highly skeptical of your alarmist claims that the Act will hurt science education in Louisiana, and take jobs away from the state, and I'll produce data that strongly suggests that that simply won't happen. Finally, I would vigorously contest the assertion made by the 75 Nobel scientists who signed your petition, that "the scope of scientific inquiry is consciously limited to the search for naturalistic principles," since supernatural design is "an explanatory principle that by its nature cannot be tested" and hence "outside the realm of science." Now, it may be true that there are no tell-tale empirical signs showing that an object is the product of supernatural design; but there are certainly tell-tale signs indicating that an object is the product of intelligent design. The monolith from Arthur C. Clarke's Space Odyssey is an obvious example: even without any knowledge of the identity, purpose or modus operandi of its maker, we could still justifiably infer that it was intelligently designed. I see no reason in principle why scientists cannot investigate the question of whether life - or the cosmos, for that matter - had an intelligent designer, whoever he, she or it may be. A game of Texas Hold'em in progress. 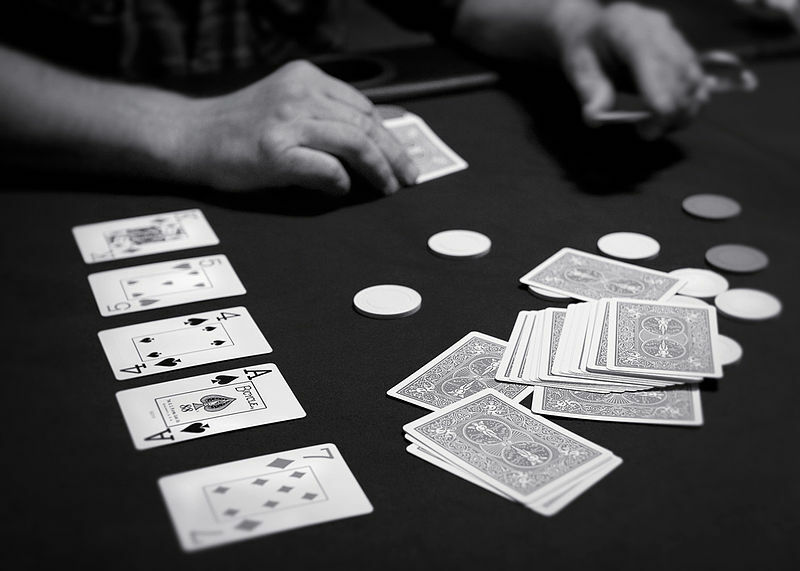 "Hold 'em" is the most popular form of poker. Photo courtesy of Tom Klassy and Wikipedia. For the next hand, I raise you 43 Nobel Laureate scientists. That's right: 43 Nobel Laureate scientists have endorsed our effort to repeal Louisiana's creationism law. ... Congresswoman Bachmann, you claim that Nobel Laureates support creationism. Show me your hand. If you want to be taken seriously by voters while you run for President, back up your claims with facts. Can you match 43 Nobel Laureates, or do you fold? As no champion has come forward to defend Congresswoman Bachmann, I would like to do so. I should state at the outset that I have never met or contacted Congresswoman Bachmann, but as an Australian residing in Japan, I wish her well from afar. I believe in giving credit where credit is due. Michele Bachmann has not only served in the United States Congress since 2007 and previously in the Minnesota State Senate, but she has also raised five children of her own and provided foster care for 23 other children. Anyone who has done all that commands my respect. The Cardsharps by Caravaggio, c. 1594. Kimbell Art Museum, Fort Worth, TX. Photo courtesy of Hugh Manatee and Wikipedia. Public domain. Whether you agree with it or not, Zack, the statement that evolution is the result of an unguided, unplanned process is not a scientific statement but a metaphysical one. To say that evolution is unguided is to say that no-one is guiding it, which means that God isn't guiding it, either. That's not a scientific assertion, Zack, and it has no place in a science classroom. Science is not equipped to evaluate supernatural explanations for our observations; without passing judgment on the truth or falsity of supernatural explanations, science leaves their consideration to the domain of religious faith. There you have it, Zack. According to the 1987 amicus brief, science cannot tell us whether evolution is guided by God, as many religious people claim, or whether it is an entirely unguided process. The assertion that evolution is guided by God is a supernatural explanation of evolution, but science (according to the signatories of the brief) deals only with natural phenomena; hence it is in no position to affirm or deny the claim. So I find it very puzzling that fifteen of the Nobel Laureates who signed your petition, Zack, also signed an earlier petition in 2005 which upheld an anti-religious view of science: that if we know a process is completely natural, we can rule out Divine guidance. That's a viewpoint which does not belong in the science classrooms of Louisiana or any other state in the U.S.A., so I'm going to cross the fifteen scientists who endorsed it off your list, Zack. Consistency compels me to do so. My own view, as an Intelligent design proponent, is that a pattern which is vastly improbable but nevertheless highly specific, can be legitimately identified as the work of an intelligent agent, if its probability lies below a critical threshold. I'll discuss this further in Part Six of my response. That leaves you with 60 cards, Zack. But I have one more big surprise for you. It's a bombshell. At least one and probably two of the 74 Nobel Laureate scientists who signed your petition don't believe in Darwinian evolution. You scoff, Zack? Don't believe me? Read on! Zack, I'm sure you're familiar with the adage, "Nothing in Biology Makes Sense Except in the Light of Evolution", which was coined by the renowned evolutionary biologist Theodosius Dobzhansky (1900-1975). It's the title of an "essay" he wrote, which was published in The American Biology Teacher, 1973, volume 35, pages 125-129. What the phrase means is that evolution is to biology what atomic theory is to chemistry. So if you're a genuine believer in Neo-Darwinian evolution, you have to believe that it is an all-encompassing theory of living things, which can explain all of their characteristics, and not just most of them. Thus if Darwin's theory of evolution is true, it has to apply to people too, and it has to be able to explain human consciousness and the human capacity for choice. If it can't, it's wrong. Zack, two of the Nobel Laureate scientists who signed your petition are "human exceptionalists" who believe that natural selection alone cannot account for the first appearance of human beings possessing consciousness. You want me to name names? I'm referring to Professor William Phillips and Professor Antony Hewish. I'm going to "out" them on this post, as their views are a matter of public record. Professor Phillips' views on human consciousness are unmistakably anti-Darwinian. I'm not so certain about Professor Hewish's views, but they also appear to be at odds with Darwinism. Proof that two of the Nobel Laureate scientists who signed Zack's petition are Darwin skeptics! 1. Professor William Phillips, Nobel Laureate scientist and "human exceptionalist"
William Daniel Phillips is a Nobel Prize-winning American physicist who shared the Nobel Prize in Physics with Steven Chu and Claude Cohen-Tannoudji in 1997 for his contributions to laser cooling, a technique to slow the movement of gaseous atoms in order to better study them, at the National Institute of Standards and Technology. Professor Phillips was especially commended for his invention of the Zeeman slower. However, Professor William Phillips has stated that he doesn't believe that Neo-Darwinian evolution can account for human consciousness, or for human choices. Professor Phillips made his views on the subject quite clear as far back as 2001, in an article entitled, Ordinary Science, Ordinary Faith, written for the Universite Interdisciplinaire de Paris (copyright, 2010). In his article, Professor Phillips wrote very movingly and candidly about his religious faith. Phillips believes that science and religion have non-overlapping magisteria: "Science can address questions about how things work and what sequence of events led to the present circumstances; religion can address questions about our relationship with God, and how we should behave toward others." However, he also argues that the methodology of the two disciplines is not so very different, and he sees striking parallels between scientific knowledge, which is based on reason and experience, and religious knowledge, which is based on Scripture and Tradition. As a believer, Professor Phillips writes that his faith in God is strengthened by his appreciation of the order and beauty of the cosmos: "When I examine the orderliness, understandability, and beauty of the universe, I am led to the conclusion that a higher intelligence designed what I see." Nevertheless, he acknowledges that other physicists, examining the same evidence, have come to the opposite conclusion, and he is inclined to think that "we will never find truly convincing scientific evidence about the existence of God." Professor Phillips believes in a personal God who answers prayers, but he is leery of performing controlled experiments to test the efficacy of intercessory prayer. He believes that God does not violate physical laws, but he also believes that God may be able to intervene in the world around us in a subtle way - for instance, at the level of quantum probability - without violating any laws. Another place where scientific investigation might make significant contributions to religious belief is the area of human consciousness. I find the fact of human consciousness and free will to be a strong argument for some sort of transcendence. If we truly have a free will, if our actions represent true choice and not just results of biochemical reactions following deterministic or random processes, then where does that will come from? If there is only physics and chemistry, where does decision come from? Of course, it may be that our impression that we have free will is illusory, or it may be that free will emerges from a sufficiently complex system all of whose components are deterministic or random. But I find these possibilities unconvincing and find it simpler to believe in a transcendence that provides something beyond determinism or chance. I call that transcendence God. But, considering the poor state of our scientific understanding of human consciousness and free will, my conclusion about the necessity of transcendence is not particularly well founded. A better understanding of consciousness, which may come from future scientific investigation, could significantly change this situation. Professor Phillips is aware of the internal tensions between his beliefs, and he is willing to change his views in the light of new evidence. But on his own admission, physics and chemistry, and biochemical reactions, are all unable to account for the emergence of free will in human beings. For Darwinists, this is heresy. The old adage, "Nothing in Biology Makes Sense Except in the Light of Evolution", which was originally coined by the renowned evolutionary biologist Theodosius Dobzhansky (1900-1975), says it all. What the phrase means is that evolution is to biology what atomic theory is to chemistry. To believe in Darwinian evolution requires one to accept that it can account for all of the characteristics of living organisms, including the human capacity to make choices. Ultimately, such a capacity has to be grounded in our biochemistry. For a Darwinist, life is the product of biochemical reactions, and all of the properties of living things - including the human capacity to make choices - have to be ultimately explicable in terms of those reactions. In other words, Darwinism is a "bottom-up" theory, not a "top-down" theory. In my next post, I shall document my claims about Darwinism in detail, in the section, Why you can't be a Darwinist and a "human exceptionalist". I am heartened to hear that Professor Phillips, like myself, does not believe that either deterministic or random processes can account for free will. I hope that he will now "come out of the closet" and publicly declare that he does not support Darwinian evolution. 2. Meet Professor Antony Hewish, Nobel Laureate scientist and also a "human exceptionalist"
"I think both science and religion are necessary to understand our relation to the Universe. In principle, Science tells us how everything works, although there are many unsolved problems and I guess there always will be. But science raises questions that it can never answer. Why did the big bang eventually lead to conscious beings who question the purpose of life and the existence of the Universe? This is where religion is necessary." Evidently, Professor Antony Hewish doesn't believe that the matter of the early universe, coupled with the laws of physics and chemistry, are sufficient to explain the appearance of consciousness. Instead, Hewish believes that consciousness is something profoundly mysterious, and that science is incapable of answering the question of how human consciousness originated. That's a perfectly respectable philosophical position, but it puts him at odds with Darwinian evolution. If you're a Darwinian evolutionist, then you have to believe that the question of why the Big Bang ultimately led to the emergence of conscious beings is a scientifically soluble one. We can see this more clearly if we break it down into two steps: (a) the chemical steps leading from the Big Bang to the emergence of the first living organisms on Earth; and (b) the evolution, over billions of years, of the first life-forms into conscious beings. All Darwinists agree that step (a) occurred as a result of law-governed physical processes of some sort, while step (b) can be explained within the framework of Darwin's theory of evolution by natural selection. Once the first life-forms appeared on Earth, the winnowing process of natural selection acting on random variations in a changing environment, would have been sufficient to bring about the subsequent appearance of conscious beings. Nothing more was required. Hence for bona fide Darwinists, science is perfectly capable of explaining the emergence of conscious beings, even if the details currently elude us. I conclude that if (as seems to be the case) Professor Antony Hewish really believes that science is incapable of explaining the emergence of conscious beings, then he is not a bona fide Darwinist. Let me be crystal clear: if you're a Darwinist, you're perfectly entitled to regard the existence of the universe as a mysterious fact which science can never explain, if you wish. But given the existence of our universe, which began at the Big Bang, the subsequent emergence of conscious beings is not a mystery, for Darwinists. It's perfectly explicable within the framework of the laws of Nature, including the processes of natural selection which operate on living things. For Darwinists, the appearance of consciousness is a scientifically tractable problem. Professor Hewish apparently believes otherwise. Well, Zack, I hope I've convinced you that two of your signatories aren't bona fide Darwinists. But cheer up: you still have 58 cards. Now I'd like to issue a challenge to you. My challenge to Zack: can you match my poker hand? Paul Cezanne, The Card Players (Les joueurs de carte), 1892-95. Courtauld Institute, London. Photo courtesy of Wikipedia. third, a list of twenty-one famous scientists in history (Andreas Vesalius, Francis Bacon, Galileo Galilei, Johannes Kepler, William Harvey, Bishop John Wilkins, Robert Boyle, John Ray, Antonie van Leeuwenhoek, (Bishop) Nicolas Steno, Isaac Newton, Carol Linnaeus, Joseph Priestley, William Buckland, Charles Babbage, Richard Owen, Louis Agassiz, James Joule, James Maxwell, Alfred Russel Wallace and Lord Kelvin) who openly flouted the so-called "rule" (known as methodological naturalism) that you're not allowed to cross the line from the natural to the supernatural, when you're doing science. As you can see, Zack, my list of scientists who flouted this rule has some pretty big names, and they're much more famous than any of your Nobel Laureates, only two of whom come close to being household names. I have selected only the most outstanding scientists in history who practiced a form of science that put them at odds with methodological naturalism, but I could have chosen many, many other scientists who did the same. So I think I'm entitled to say, Zack, that my 27 (= 6 + 21) Nobel Laureate scientists who opposed Darwinian evolution either as a biological theory or as an account of the mind, combined with my 21 famous scientists in history who defied methodological naturalism, and many other lesser scientists who did the same, trump your 59 remaining Nobel Laureate scientists who respect religion, but who oppose a discussion of the serious scientific shortcomings of Darwin's theory of evolution in the classroom. I should add that no less than ten of the twenty-one famous scientists I cited above - namely, Andreas Vesalius, William Harvey, Bishop John Wilkins, Robert Boyle, John Ray, Antonie van Leeuwenhoek, Isaac Newton, Alfred Russel Wallace, Louis Agassiz and Lord Kelvin - also put forward Intelligent Design arguments in their scientific works, and three of them (John Ray, Antonie van Leeuwenhoek and Alfred Russel Wallace) even argued against the possibility of life arising from non-living matter! The funny thing is that these scientists all thought that they were doing perfectly legitimate science when they were arguing against naturalism. One of these scientists (Kepler) even appealed to the supernatural ("God would have done it this way") when attempting to validate his new scientific theory of how the planets move. Now, you might not agree with these kinds of arguments. Fair enough. But my point is that if these very famous scientists from the past thought that both Intelligent Design arguments and arguments for the existence of a supernatural Being belonged in a science book, and none of their contemporaries picked them up for saying that, then the claim made by the scientists who signed your petition, that Intelligent Design isn't "real science" because it doesn't stay within the bounds of the natural world, is simply bogus. No-one has ever decreed that science has to confine itself to naturalistic explanations, and no-one ever will, because science does not answer to any human authority. Scientists are independent thinkers: "Take nobody's word for it" (the motto of the Royal Society) is the guiding motto of science. I conclude that there is no reason in principle why Intelligent Design cannot be taught in a science classroom. Regardless of whether it's right or wrong, it's a perfectly legitimate scientific endeavor. You're probably wondering exactly where I stand on the question of origins, Zack. I believe in a 13.7 billion-year-old universe and a 4.5 billion-year-old Earth, and I also accept the common descent of species. However, I've yet to see any evidence for the claim that natural processes which lack foresight (i.e. random variation culled by natural selection) are sufficient to explain the major biological innovations that have occurred during the past four billion years. I believe that the universe was fine-tuned to permit the subsequent development of life, and I would also argue that there are certain structures found in living things whose functional complexity indicates that they could only have been designed by an Intelligent Agent, whom I believe on philosophical grounds to be God, the Creator of the cosmos. I'm fairly open-minded about how and when the Designer of life produced the complex designs that we find in the cell. I tend to believe that the Designer manipulated organisms' genes at various points in history; however, I realize that there are some Intelligent Design proponents (such as Professor Michael Behe) who suggest that the Designer could have "front-loaded" the universe with the specified information required to produce living things at the Big Bang, thus obviating the need for any supernatural intervention in the history of the cosmos. Who knows? Well, that's enough about me. Let's get back to my list of six Nobel scientists who believe in Intelligent Design or oppose evolution. The Nobel scientists on this list are certain to cause acute embarrassment to scientists campaigning against the teaching of Intelligent Design in schools. As we'll see, the example of these Nobel scientists demonstrates: (a) that the teaching of Intelligent Design can be completely divorced from the teaching of religion; (b) that you can believe in Intelligent Design on purely scientific grounds, without believing in the supernatural, let alone supernatural intervention; and (c) that Intelligent Design is a genuinely scientific endeavor. The first name on my list is a living Nobel Laureate who openly acknowledges his belief in a version of Intelligent Design: Dr. Brian Josephson, winner of the Nobel prize for Physics in 1973, and a truly independent thinker whose integrity I greatly respect. Interestingly, he appears to be an atheist! According to an interview entitled "Why Brian Josephson Embraced ESP" (link dead, but you can still see the script if you go to this page and scroll down to the comment by Chu Gai, dated 07-15-10, 10:03 AM) that Josephson gave to John Horgan on October 16, 2006, he grew up as a strict scientific materialist. "I was pretty well turned off religion by the rituals," he said. And as far as I can tell, Dr. Josephson is still an atheist. In a lecture delivered on his 70th birthday, on May 5, 2010, Josephson put forward a non-theistic version of intelligent design, in which he seemed to favor an infinite regress of causes, and didn't mention God once. Zack, I put it to you that the example of Dr. Brian Josephson utterly refutes your claim that teaching Intelligent Design is tantamount to teaching religion, and that Intelligent Design requires you to believe in a supernatural Being who periodically intervenes in the cosmos. Josephson is not religious, and he doesn’t believe in a supernatural being; all he believes in is some sort of mind (or minds) outside our cosmos. Current physics implicitly assumes matter is fundamental, life and mentality being secondary. There are reasons for thinking that such a picture may be incomplete, leading to error. This lecture describes a new conceptual foundation that reverses the order of things, making life and mentality more basic than matter. You could say what I've been proposing is an extension of science because mind has been added, a whole new thing is added into the picture, and some ideas as to how to handle it, but they're not the usual equations, they're rather complicated ideas like attractors and information processors, and of course quantum theory regards information as fundamental as well, so there may be lots of links with conventional science. Well that would lead I think to taboo ideas becoming a part of science, not a respectable part, but a reluctantly accepted part, because they would come nicely out of this picture, so I guess I'll kind of list them here. So I said at some point this theory looks a bit like theology, and I can imagine intelligent design is real. Intelligent Design is rejected just because it's part of the scientific culture that it cannot be true, you must not talk about it, but it’s not actually disproved. I think it will turn out that there is a design and that the usual theories are wrong there as well. Readers can view a slideshow of Dr. Josephson’s talk here. Slides 16, 23, 30 and 31 should be of special interest. Readers who listen to Dr. Josephson's lecture will notice the tentative, undogmatic tone he adopts. Also, at no point in the lecture does he even use the word "God." I defy anyone to listen to the talk that Dr. Josephson delivered to the Cambridge Physics Society, and call it "religious." Teaching Intelligent Design does not involve teaching religion. Now I can imagine that some readers will ask what kind of Intelligent Design Dr. Josephson is endorsing. Is it the real McCoy? Yes, it is. According to the definition of intelligent design provided by the Discovery Institute, "The theory of intelligent design holds that certain features of the universe and of living things are best explained by an intelligent cause, not an undirected process such as natural selection." If you believe that the cosmos or living things possess empirically detectable features which imply that they were designed, then you're an Intelligent Design advocate. You don't have to use jargon like "functional complex specified information" to qualify as an Intelligent Design supporter. On Powerpoint slide 7 of the a lecture that he delivered to the Cambridge Physics Society on March 5, 2008, entitled, "A Critical Point for Science? ", Josephson lists four empirical criteria in support of his conclusion that the universe was designed to be bio-friendly, by some sort of mind (see slide 16). He lists one feature of the universe as a whole (the observer problem, or the apparent absence of "many worlds"), one feature of life (complementarity, or the inability of quantum mechanics to specify the properties of living systems which have not yet been measured - think of Schrodinger's cat), and two features of the human mind (higher cognitive capacities such as our capacity for mathematical insight and musical appreciation, and paranormal capacities such as ESP). I think we can fairly conclude that Josephson is a bona fide Intelligent Design advocate. The second name on my list should be even more embarrassing for you, Zack. I'm referring to Richard Smalley (1943-2005), winner of the 1996 Nobel Prize in Chemistry. Now I noticed, Zack, that right at the top of your list of Nobel Laureates is the name of Sir Harold Kroto, who shared the 1996 Nobel Prize in Chemistry with Richard Smalley. So now I ask: which Nobel Prize winner are we supposed to believe, Kroto or Smalley? The burden of proof is on those who don't believe that "Genesis" was right, and there was a creation, and that Creator is still involved. But wait, there's more! Smalley also invoked cosmic fine-tuning as a scientific argument for God's existence, and stated publicly that he had been persuaded on strictly scientific grounds that evolution was impossible. Recently I have gone back to church regularly with a new focus to understand as best I can what it is that makes Christianity so vital and powerful in the lives of billions of people today, even though almost 2000 years have passed since the death and resurrection of Christ. "Puts the evolutionary model to death"?! These are strong words for a Nobel scientist, Zack. So I hope you can understand that when I posed the question above, "Which Nobel Prize winner are we supposed to believe, Kroto or Smalley? ", I wasn't being flippant. If a Nobel Prize winner in Chemistry thinks it is now clear that evolution could not have occurred, then I think that high school students in Louisiana are entitled to hear why. Wouldn't you agree, Zack? Now, I'm sure that alert readers who checked out the last link will have noticed that at the time when Dr. Smalley made those remarks in 2005, Dr. Hugh Ross and Dr. Fuz Rana (who are Old Earth creationists) had spoken out against the teaching of Intelligent Design in schools – not because it was too supernaturalistic, but because it wasn't sufficiently scientific. In particular, they claimed that ID didn't make any testable, falsifiable predictions, whereas their Old Earth creationist model made lots of predictions. Well, I'm happy to say that this concern has been addressed. Signature in the Cell, by the best-selling book by Intelligent Design proponent Dr. Stephen Meyer, contains an entire appendix (18 pages) of scientific predictions made by the theory of Intelligent Design. There's a list of a dozen detailed predictions at the end of the chapter. Rick Smalley, a Nobel laureate in chemistry at Rice University, died earlier this week. You can read about his scientific contributions and passing here. I had the privilege of having lunch with Rick this summer. The meeting was arranged by his pastor at Houston’s Second Baptist Church, my friend Ben Young. Rick had in the previous year become a Christian as well as a member of Second Baptist Church, and begun to express his doubts about Darwinism publicly (see here and here). I reported on my lunch meeting with Rick here, though to spare him harrassment I did not mention him by name. Rick's prediction at the end of his life was that ID would be mainstreamed in five years and that evolution in its conventional materialistic sense would be dead within ten. It will be interesting to see if his predictions are borne out. I had an extended meeting today with two of the nation's top scientists, one of them a Nobel laureate. The Nobel laureate spoke of evolution as “bankrupt” and thought ID would be mainstreamed in five years. The other scientist was not as optimistic about this timetable, but agreed with his colleague's assessment of evolution. He also noted that with the Internet it wasn’t possible for professors to command the deference of students as in times past. For instance, whereas in the past he was able to throw together problems sets simply by cribbing from textbooks, today he finds that students need merely consult the Internet to find perfect solutions to such problems. Professors are therefore no longer the sole repository of answers for students. Accordingly, the scientific priesthood is undergoing a shake-up. This is all to the good of ID, which thrives as the subversive instrument par excellence for exposing priestcraft dressed in a scientific lab coat. Abdus Salam was awarded the Nobel Prize in Physics for his work on the electroweak unification of the electromagnetic and weak forces. Salam, Sheldon Glashow and Steven Weinberg shared the Nobel prize for this discovery. Was Abdus Salam a devout Ahmadi Muslim? Thou seest not, in the creation of the All-merciful any imperfection, Return thy gaze, seest thou any fissure. Then Return thy gaze, again and again. Thy gaze, Comes back to thee dazzled, aweary. In 1974, the Pakistan Parliament made a constitutional amendment that declared Ahmadi Muslims as 'non-Muslims'. In protest, Salam left Pakistan for London. From his childhood he offered five daily prayers. In the pocket of his jacket he used to carry of a small copy of the Holy Quran. At his home in Putney, while he was engrossed in his research, he used to listen to taped recitation of Holy Quran by outstanding Qarees of the Muslim world. He performed lesser pilgrimage, Umra when he was not internationally renowned. Despite his wish to perform Hajj, he could not do so on account of his religious beliefs. The Saudi Government would not grant him a visa. When Ahmadis were declared non-Muslims in 1974 by Government of Pakistan, he grew [a] beard and assumed the forename Muhammad to show his pride in being a Muslim. He used to lead the Friday congregational prayer for Muslim students at the International Centre for Theoretical Physics, in Italy. When his father was staying with him in London, he could have bought a house in a posh London suburb, but he chose to buy a house in Putney, because it was close to FAZAL Mosque, where his father could easily go for daily prayers. On Fridays Dr Salam used to arrive at the mosque early and would take a seat in the front row. Even during the summer, he would don a winter jacket and a hat. When the Imam was delivering sermon, he would take out a notebook and start making notes. One day Imam Rafiq asked him: Do you like my sermon so much that you take notes? Dr Salam replied, the fact of the matter is that I get flashes of scientific ideas like an electric current, so I jot them down right away. These ideas subsequently become basis for my theories. If I don't write them instantly, chances are I will lose them. I think we may take it as safely established that Abdus Salam believed in the tenets of his faith as an Ahmadi Muslim. Which brings us to the next question: what do Ahmadi Muslims believe about evolution? What do the Ahmadis believe about evolution? According to the Wikipedia article, Ahmadiyya views on evolution, "The Ahmadiyya Movement is the only denomination of Islam that universally accepts in principle the process of evolution, albeit divinely guided, and actively promotes it" (Jesus and the Indian Messiah – 13. Every Wind of Doctrine). Rather than adopting the Darwinist theory of unguided natural selection, Ahmadis promote the supposition of “guided evolution” as being part of the progressive design of God. As such they deny that natural selection occurred purely by chance, or merely by survival of the fittest – and view each stage of the evolutionary process as being selectively and continually woven to an intricate level by one monotheistic creator (Allah). Furthermore illustrated with scientific theories and Quranic scripture, Ahmadis contend that the processes of life on Earth started from one single point of species (bacteria) with a mixture of water and a viscous clay-like substance. From the source of that one single organism, to the point of the first Prophet Adam (so the Ahmadiyya view) was a slow gradual evolutionary process that occurred over several stages (Lane). Each stage being of a variable timescale - perhaps over billions of years. Proponents of Ahmadiyya consider that the notion of unguided 'natural selection' does not adequately explain how various species that have progressed from the lowest forms to the highest forms have solely depended upon occurrence of random mutations within the gene pool, or purely by the demands of environmental factors. In his book Revelation, Rationality, Knowledge and Truth (published 1998), Mirza Tahir Ahmad, the late leader of the Ahmadiyya movement, elaborated the complex mechanism of evolution as having been played more like strategic game of Chess than a game of Dice. Subsequently evolutionary processes could only have been guided by a vastly higher intelligence (God). 4. Revelation, Rationality, Knowledge & Truth: Part V, Section 5: Survival by Accident or Design? 7. Review of Religions eGazette November 2008. 10. Revelation, Rationality, Knowledge & Truth: Part V, Section 10: A Game of Chess or a Game of Chance! ...[W]e have decided to bring this subject to a close by quoting some competent scientists who had to confess that the only solution to the problem of creation lies in the admission that there does exist a Supreme Creator. It was He who created options at every creative step and it was He Himself who selected the right option to usher the creation into a higher order of existence. Hence, stage after stage it was He who made choices with purpose, design and direction. What he evidently means is that in the long journey of evolution we find design, order and harmony which cannot be ascribed to chance. The time scale required for evolution, if haphazard blind brainless chance were to be its creator, is so enormously large that it boggles the mind of even the most expert mathematician. No human expression can describe it, no human mind can grasp the immensity of the figures involved. As mentioned earlier, Allen estimated the time needed for the chance synthesis of the complex proteins to be 10^248 years. The entire span of evolution however requires a much larger slice of time than the mere production of proteins to which Allen refers. To help the unfamiliar reader visualize this mathematical concept, we would like to remind him that the total age of the universe since the Big Bang is only eighteen to twenty billion years. No name has been ever invented or will ever be invented to denote the astronomical figure Professor Frank Allen has worked out. Perhaps eternity is the nearest name to it. Evidently it takes a very determined person who is otherwise sane to believe in such insanity. Yet many sane, highly intellectual scientists do believe in it. Their case is like that of a religious fanatic, who in ordinary affairs of life appears quite normal, but when it comes to matters of faith and belief, shuts himself off completely from the light of rationality and common sense into a cocoon of mindless prejudice. Zack, I put it to you that the foregoing quote plainly shows that the Ahmadis obviously believe in a version of Intelligent Design. They believe that evolution had to be intelligently guided towards its goal by God, because otherwise it could never have produced the Earth's various life-forms (including human beings) in the time since the Big Bang. We may therefore safely conclude that Nobel Prize winner Abdus Salam, as a devout Ahmadi Muslim, could be fairly described as an Intelligent Design theorist of some sort. Specifically, Dr. Abdus Salam did not believe in the Darwinian theory of evolution. Rather, he believed that God explicitly guided evolution like a chess player. Ernst Chain shared the 1945 Nobel Prize in Medicine and Physiology with Alexander Fleming and Howard Florey for his work on penicillin, the world's first antibiotic, which has saved the lives of perhaps as many as 200 million people (a number obtained from a Swedish source, but without explication - see also here and here). Chain's role was to figure out a way of isolating and purifying penicillin. (2) 50 Nobel Laureates and other great scientists who believed in God by Tihomir Dimitrov. Dimitrov has an M.Sc. in Psychology (1995) and an M.A. in Philosophy (1999). He compiled the quotations over a period of 11 years, corresponding with many contemporary Nobel Prize-winning scientists who have shared their personal beliefs about God. He also studied hundreds of books, articles and letters – primarily those found in the archives of the National Library of Bulgaria (Sofia), Biblioteca Comunale di Milano and the Austrian National Library (Vienna). Ernst Chain could best be described as a theistic, anti-Darwinian evolutionist who rejected the materialistic Darwinian theory of evolution. "I would rather believe in fairies than in such wild speculation. "I have said for years that speculations about the origin of life lead to no useful purpose as even the simplest living system is far too complex to be understood in terms of the extremely primitive chemistry scientists have used in their attempts to explain the unexplainable that happened billions of years ago. God cannot be explained away by such naive thoughts." (Chain, as cited in The Life of Ernst Chain: Penicillin and Beyond, by Ronald W. Clark, London, Weidenfeld & Nicolson, 1985, 147-148). This mechanistic concept of the phenomena of life in its infinite varieties of manifestations which purports to ascribe the origin and development of all living species, animals, plants and micro-organisms, to the haphazard blind interplay of the forces of nature in the pursuance of one aim only, namely, that for the living systems to survive, is a typical product of the naive 19th century euphoric attitude to the potentialities of science which spread the belief that there were no secrets of nature which could not be solved by the scientific approach given only sufficient time. "Any speculation and conclusions pertaining to human behaviour drawn on the basis of Darwinian evolutionary theories from animal ethological studies, and in particular ethological studies on primates, must be treated with the greatest caution and reserve. "It may be amusing for those engaged in the task to describe their fellow man as naked apes, and a less discriminating section of the public may enjoy reading about comparisons between the behaviour of apes and man, but this approach – which, by the way, is neither new nor original – does not really lead us very far. "We do not need to be expert zoologists, anatomists or physiologists to recognise that there exist some similarities between apes and man, but surely we are much more interested in the differences than the similarities. Apes, after all, unlike man, have not produced great prophets, philosophers, mathematicians, writers, poets, composers, painters and scientists. They are not inspired by the divine spark which manifests itself so evidently in the spiritual creation of man and which differentiates man from animals." (Chain, 1971, "Social Responsibility and the Scientist in Modern Western Society," Perspectives in Biology and Medicine, Spring 1971, Vol. 14, No. 3, p. 368). "It is, of course, nothing but a truism, and not a scientific theory, to say that living systems do not survive if they are not fit to survive. "To postulate, as the positivists of the end of the 19th century and their followers here have done, that the development and survival of the fittest is entirely a consequence of chance mutations, or even that nature carries out experiments by trial and error through mutations in order to create living systems better fitted to survive, seems to me a hypothesis based on no evidence and irreconcilable with the facts. "This hypothesis wilfully neglects the principle of teleological purpose which stares the biologist in the face wherever he looks, whether he be engaged in the study of different organs in one organism, or even of different subcellular compartments in relation to each other in a single cell, or whether he studies the interrelation and interactions of various species. These classical evolutionary theories are a gross oversimplification of an immensely complex and intricate mass of facts, and it amazes me that they were swallowed so uncritically and readily, and for such a long time, by so many scientists without a murmur of protest." (Chain, 1971, "Social Responsibility and the Scientist in Modern Western Society," Perspectives in Biology and Medicine, Spring 1971, Vol. 14, No. 3, pp. 367). There is no doubt that such variants do arise in nature and that their emergence can and does make some limited contribution towards the evolution of species. The open question is the quantitative extent and significance of this contribution. Chain, E. 1970. Social Responsibility and the Scientist in Modern Western Society. London: The Council of Christians and Jews, p. 25. "Only one theory has been advanced to make an attempt to understand the development of life – the Darwin-Wallace theory of evolution. And a very feeble attempt it is, based on such flimsy assumptions, mainly of morphological-anatomical nature that it can hardly be called a theory." Chain, E. 1970. Social Responsibility and the Scientist in Modern Western Society. London: The Council of Christians and Jews. Chain, Ernst Boris. 1971. "Social Responsibility and the Scientist in Modern Western Society," Perspectives in Biology and Medicine, Spring 1971, Vol. 14, No. 3, pp. 347-369. 5. Wolfgang Pauli (1900-1958), winner of the Nobel Prize for Physics in 1945. Wolfgang Pauli was one of the true giants of 20th century physics. In 1945, after being nominated by Albert Einstein, he received the Nobel Prize in Physics for his "decisive contribution through his discovery of a new law of Nature, the exclusion principle or Pauli principle," involving spin theory, underpinning the structure of matter and the whole of chemistry. Wolfgang Pauli left the Catholic Church as a young man, in 1929 (see his Wikipedia biography and see this online article on Jewish Physicists, footnote 40, for additional details). As far as I can tell, Pauli did not believe in God in later life. For instance, in his letter to Sambursky of October 7, 1957 (see footnote 51 in this article), he declared his belief that ultimate reality is impersonal. Given his atheism, then, it is all the more remarkable that Pauli had little patience with the Darwinian theory of evolution. Few people are aware that Pauli was highly skeptical of Darwinian evolution, openly questioning the orthodox view that random mutations, culled by natural selection, were sufficient to explain the diversity of life-forms we see today. Pauli regarded Darwinian evolution as an implausible mechanism for evolution, on purely mathematical grounds. In place of Darwinian evolution, Pauli advocated a kind of directed evolution. "As a physicist, I should like to critically object that this model has not been supported by an affirmative estimate of probabilities so far. Such an estimate of the theoretical time scale of evolution as implied by the model should be compared with the empirical time scale. One would need to show that, according to the assumed model, the probability of de facto existing purposeful features to evolve was sufficiently high on the empirically known time scale. Such an estimate has nowhere been attempted though." "In discussions with biologists I met large difficulties when they apply the concept of 'natural selection' in a rather wide field, without being able to estimate the probability of the occurrence in an empirically given time of just those events, which have been important for the biological evolution. Treating the empirical time scale of the evolution theoretically as infinity they have then an easy game, apparently to avoid the concept of purposesiveness. While they pretend to stay in this way completely 'scientific' and 'rational', they become actually very irrational, particularly because they use the word 'chance', not any longer combined with estimations of a mathematically defined probability, in its application to very rare single events more or less synonymous with the old word 'miracle'." "I am of course getting angry if biologists try to use the general concept 'chance' in order to explain phenomena which are so typical for living organisms as, for instance, those appearing in the biological evolution." "Probably the situation is a complex one and beside the holy chance there exist processes with a directed goal and also causal influences of the environment on inherited properties on the way over the cytoplasma." "My elaborations concerning neo-Darwinism made [Delbruck] very angry. He talked about a 'plot of unemployed theoretical physicists against biology'." Mayr, one of the founders of Modern Synthesis, rejected Pauli's (and Bohr's) criticism as well. Similar to Delbruck, he played it down as based on an "oversimplified understanding of the biological processes involved in evolution" (Mayr 1982, p. 429). 64 Pauli (1954b), p. 298. Translated by the authors. 65 Letter by Pauli to Bohr of February 15, 1955, letter 2015 in von Meyenn (2001), p. 105. 66 Letter by Pauli to Delbruck of February 6, 1954. Letter 1720 in von Meyenn (1999), p. 472. 67 Letter by Pauli to Delbruck of February 4, 1954. Letter 1712 in von Meyenn (1999), p. 452. 68 Letter by Pauli to Elsasser of September 30, 1958. Letter 3067 in von Meyenn (2005a), p. 1271. Translated by the authors. Mayr, E. (1982): The Growth of Biological Thought. Diversity, Evolution, and Inheritance. Cambridge (Massachusetts), Harvard University Press. Meyenn, K. von, (ed.) (1999): Wolfgang Pauli. Wissenschaftlicher Briefwechsel, Band IV, Teil II: 1953–1954. Berlin, Springer. Meyenn, K. von, (ed.) (2001): Wolfgang Pauli. Wissenschaftlicher Briefwechsel, Band IV, Teil III: 1955–1956. Berlin, Springer. Meyenn, K. von, (ed.) (2005b): Wolfgang Pauli. Wissenschaftlicher Briefwechsel, Band IV, Teil IV-B: 1958. Berlin, Springer. Zack, I submit that the example of Wolfgang Pauli, who was an atheist, suffices to refute the claim that skepticism of Darwinian evolution is always religiously motivated. In Pauli's case, as we have seen, it was mathematically motivated. "This model of evolution is an attempt, in line with ideas of the second half of the 19th century, to adhere to the total elimination of all traces of finality. This must, then, somehow be replaced by introducing elements of chance." Only few biologists have the courage to refer to final causes since teleological approaches are reputed to lack explanatory power. This premise is usually accepted on faith and without logical evidence. The disrepute of teleological accounts is partly (and ironically) due to the strange belief (defended, e.g., by Stegmuller 1984) that they require a causal explanation in terms of ghosts, demons or an intelligent creator. 71 Pauli (1954b), p. 297. Translated by the authors. 73 Quoted from the Lecture to the Foreign People. Translated by the authors. Meyenn, K. von, (ed.) (2005a): Wolfgang Pauli. Wissenschaftlicher Briefwechsel, Band IV, Teil IV-A: 1957. Berlin, Springer. Wolfgang Pauli interpreted the laws of quantum mechanics as leading to a lucid Platonic mysticism, a position intermediate between the skepticism of Western science centered on objective observer-independent facts, and the philosophies of ancient Eastern mysticism which put primary emphasis on conscious experience. During the last three decades of his life, Pauli embraced a kind of Jungian mysticism. Pauli believed that ultimate reality was impresonal, but he also believed that at some ultimate level, the mental and physical were one. Thus he may be fairly regarded as a dual-aspect monist, along the lines of the philosopher Spinoza. Pauli's views on the mind were heavily influenced by Pythagoras, Plato and Jung, as Atmanspacher and Primas (2006) document in sections 5.1 to 5.4 of their article, Pauli’s ideas on mind and matter in the context of contemporary science (Journal of Consciousness Studies 13, 5-50, 2006). It should be pointed out that Pauli's dual-aspect monism is incompatible with Darwinism, as it elevates the mental to the same ontological status as the physical: both are complementary aspects of an underlying reality. According to the Darwinian theory of evolution, however, our psychology is rooted in our biology, which in turn emerges from the laws of chemistry and physics. In other words, matter is primary, and mind is secondary. Pauli did not share this Darwinian view. Readers who would like to know more about Pauli's fascination with dreams and the Jungian notion of synchronicity are welcome to check out the links below. Pauli’s ideas on mind and matter in the context of contemporary science by Harald Atmanspacher and Hans Primas (Journal of Consciousness Studies 13, 5-50, 2006). Wolfgang Pauli: Resurrection of Spirit in the World by Dr. F. David Peat, a theoretical physicist residing in Ottawa, Canada, whose recent book, Synchronicity: The Bridge between Matter and Mind (Bantam, 1987). Divine Contenders: Wolfgang Pauli and the Symmetry of the World by Dr. F. David Peat. Originally published in Psychological Perspectives: A Semi-Annual Journal of Jungian Thought, Spring-Summer 1988. (This article discusses Pauli's views on synchronicity.) See also this essay of the same title, by Dr. F. David Peat. Quantum Mysticism: Gone but Not Forgotten by Lisa Zyga at Physorg.com, June 8, 2009. Marconi explicitly stated his belief that science would never be able to solve the problem of the origin of life. This fact alone makes him an Intelligent Design advocate, at the very least, and possibly a creationist. You may say that 1934 is a long time ago, Zack. Fair enough. But you wanted Nobel Laureates, and I've already given you six. Now I'm going to give you two more names, of scientists who espoused either Intelligent Design or creationism, and who may well have been denied a Nobel Prize for "political" reasons. Hoyle's principal contribution to science was his work on nucleosynthesis: the idea that the chemical elements were synthesized from primordial hydrogen and helium in stars. Many scientists were dismayed that a Nobel prize was awarded to his collaborator William A. Fowler, but Hoyle himself was excluded from the prize. (See Fred Hoyle: the scientist whose rudeness cost him a Nobel prize by Robin McKie. Article in The Guardian, 2 October 2010; The Observer, 3 October 2010.) "I have no idea how the Swedes decided to make an award to Chandrasekhar and Fowler but not to Hoyle," admits astronomer Lord Rees, president of the Royal Society. "However, I think it would be widely accepted that it was an unfair misjudgment." On the other hand, Sir Harry Kroto, winner of the 1996 Nobel Prize in Chemistry, argues that Hoyle was lacking in scientific objectivity, and that he would have used his Nobel to foist his views on the scientific community, had it been awarded to him. At any rate, there can be no doubt that Hoyle possessed a brilliantly original scientific mind, and was a truly independent thinker. "The notion that not only the biopolymer but the operating program of a living cell could be arrived at by chance in a primordial organic soup here on the Earth is evidently nonsense of a high order." Hoyle famously compared the random emergence of even the simplest cell to the likelihood that "a tornado sweeping through a junk-yard might assemble a Boeing 747 from the materials therein." Hoyle also compared the chance of obtaining even a single functioning protein by chance combination of amino acids to a solar system full of blind men solving Rubik's Cube simultaneously. Hoyle's famous comment "tornado-in-a-junkyward" metaphor has been dubbed "Hoyle's fallacy" by evolutionary biologists, who either accuse him of employing faulty mathematics in his calculations of the probability of life originating by undirected processes, or accuse him of making faulty biological assumptions in his origin-of-life scenario. The Wikipedia article Hoyle's fallacy accuses him of both, for good measure. Ian Musgrave's online article, Lies, Damned Lies, Statistics, and Probability of Abiogenesis Calculations is a more in-depth treatment of Hoyle's alleged errors. Regarding the accusation of mathematical incompetence: it needs to be remembered that Hoyle was a mathematician as well as an eminent astronomer. So was his collaborator, Professor Chandra Wickramasinghe, with whom Hoyle co-wrote Evolution in Space. The idea of not one but two mathematicians making an elementary blunder in probability theory, as their Darwinist critics commonly allege, is so absurd as to beggar belief. There isn't any outsider who penetrated so deep in population genetics as astronomer- mathematician Sir Fred Hoyle, with such a mathematical knowledge, with such an integrity to find out the truth, and without distorting his subject of investigation. Regarding the charge that Hoyle was misinformed on matters relating to biology, when putting forward his "tornado-in-a-junkyard" argument, the Australian biologist Stephen Jones has defended Hoyle's competence in an article on his blog, CreationEvolutionDesign, entitled, Re: Fred Hoyle about the 747, the tornado and the junkyard (October 17, 2008). I would like to point out, however, that much more up-to-date calculations of the likelihood of a functional protein originating by chance are now available, thanks to the pioneering work of Dr. Douglas Axe. These results, which I shall duscuss in Part Five of my response, bear out the broad thrust of Hoyle's probability estimates, and show that even the formation of a single protein on the primordial Earth - let alone a living cell - would have been astronomically imnprobable, and tantamount to a miracle. Raymond Vahan Damadian is the inventor of the first MR (Magnetic Resonance) Scanning Machine — described by M.I.T. as "one of the most useful diagnostic tools of our time." He has also received over 45 patents (some co-invented) for improvements to his MRI scanner. Dr Damadian's invention of the first Magnetic Resonance Scanning Machine has earned him several top awards, including the United States' National Medal of Technology, the Lincoln-Edison Medal, and induction into the National Inventors Hall of Fame alongside Thomas Edison, Alexander Graham Bell and the Wright brothers. In 2003, the Nobel Prize in Physiology or Medicine was awarded to Paul Lauterbur and Sir Peter Mansfield for their discoveries related to MRI. Although Nobel rules allow for the award to be shared by up to three recipients, Damadian was not given the prize - a controversial decision which attracted criticism from various MRI experts including John Throck Watson, Eugene Feigelson, V. Adrian Parsegian, Dr. David Stark and James Mattson (see here), although some other MRI experts sided with the Nobel Committee. Damadian himself telephoned the Nobel Committee, organized a group called "The Friends of Raymond Damadian" and placed full-page advertisements in The New York Times and the Washington Post, costing about $US200,000 ($290,000) (see here and more links to ads on this page). He [Damadian] is also fundamentalist Christian and a young earth creationist and a member of the 'Technical Advisory Board' of the Institute for Creation Research. Dr Damadian says emphatically that his greatest scientific discovery was to find that 'the highest purpose a man can find for his life is to serve the Will of God.' He recently attended a major seminar at which he heard creation speaker Ken Ham calling for Americans to return to trust in the whole Word of God 'beginning with Moses and the prophets.' He says that he is tremendously encouraged by the creation science ministry and blessed by it, calling it 'a courageous exposition of the truth' and a vitally important message for America today. He believes that rejection of God's account of Creation as the foundation for our society is basic to the spiritual, social and economic sickness of our times. We are replaying 'the seven steps of human regression and social disintegration' which the Apostle Paul described in Romans chapter 1 as happening subsequent to the rejection of the true God as Creator. All of my life I have fought for evolution and against Creationism - in writings, on the podium, and in court in 1981 as a witness in Arkansas against a law demanding that Creation Science be taught alongside evolution in the state supported schools. But as one who loves science above all and thinks it the greatest triumph of the human spirit - as one who has no religious beliefs whatsoever - I cringe at the thought that Raymond Damadian was refused his just honor because of his religious beliefs. Having silly ideas in one field is no good reason to deny merit for great ideas in another field. Apart from the fact that this time the Creation Scientists will think that there is good reason to think that they are the objects of unfair treatment at the hands of the scientific community. There you have it, Zack. If a leading crusader against creationism admits that a scientist might have been denied a Nobel Prize because he is a creationist, then I think it is fair to conclude that the paucity of Nobel Laureates who espouse creationism or Intelligent Deisgn reflects a bias on the part of the Nobel Committee. Well, that's the end of Part One of my response, Zack. In Part Two, I'd like to discuss the twenty-one Nobel Laureates whom I've identified as "human exceptionalists" - scientists who accepted evolution as a biological theory, but who did not believe that the human mind could be explained by the theory of evolution.